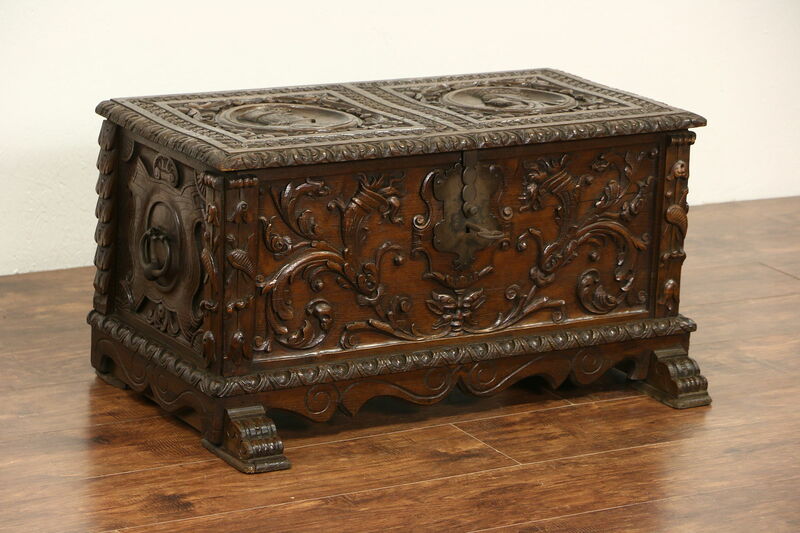 A regal Italian hand carved oak dowry chest or trunk has cameo carvings of the crowned aristocratic pair for whose wedding this antique was created. Deeply sculpted detailing is masterful on this antique traditional furniture in the Renaissance manner, called a "Cassone." The giant lock and key still work, hardware is hand wrought. Waxed and buffed, the old finish is in very fine condition, all it needs is an occasional wipe with a soft dry cloth. There are several shrinkage shrinkage separations from age, see photos. Measurements are 24" wide, 19" deep and 17 1/2" tall.